Follow along live as the Sounders host FC Dallas in the first leg of their Western Conference semifinal series on Sunday night at CenturyLink Field. Kickoff is set for 6:40 p.m. PST on Fox Sports 1. 57' - Quick response from Dallas. Hollingshead plays in Urruti who forces a nice save out of Frei. 3-0 and the treble dream may die in the conference semifinals if FC Dallas can't pull one back. Mauro Rosales time, for sure. Goodnight and good luck, FCD. 58' - Goal Seattle. 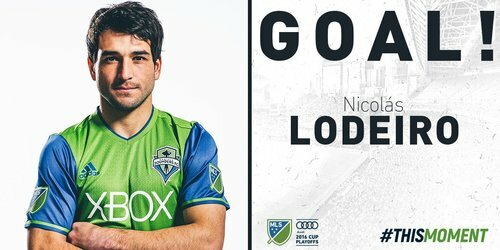 Lodeiro puts things from bad to worse. 3-0. Oscar Pareja also said Carlos Ruiz had an hour in him. Could see him for 30 minutes here. MLS is so insane that seeing a #1 seed folded into a pretzel and consumed in three bites is like the most normal thing in the world. There are no words for #ThisMoment ! 64' - FCD pushing forward looking to get back into the match earning multiple corners in the last few minutes. One more @SoundersFC ?? One more!!!! Schmetzer chant heard on FS1. If SSFC makes it farther than last year, overcoming the team that put it out, hard not to give him the job. 73' - FC DALLAS SUB - Mauro Rosales comes into the match for Walker Zimmerman. Still 3-0 Seattle. Strong says Rosales, according to Schmetzer, "was a pleasure to work with." Has Schmetzer said one negative thing since taking over? Even re: Peter Vermes, he as deferential. "Vermes said you said X." "I don't know about that, but 'Pete' is such a great coach." 78' - Aaaaaah. Rosales bends in a delightful free kick and it goes straight through the box. Just needed a touch. 3-0. Schmetzer on Big Bang Theory: "I'm tired of people saying it's bad. (Taps pen on table.) I don't watch. Others do. There's room for all."